Matzoh? Absolutely. Maror? Fughettaboutit! Charoses? The bitter herb? Let’s find out. Passover with your child can be as much a headache as it is rewarding. Though your child can’t yet drink the four glasses of wine, you may find yourself with an extra glass of wine. However, your little one may not know exactly what’s going on or who’s this Elijah fellow everyone’s waiting for, but the Seder can still be a wonderful and fascinating experience for both of you. There are new foods, new people, children running around the house trying to find the afikomen (it’s in the record collection by the way). Your child's age and interest will determine how much you involve them in the storytelling and ceremonial aspects of the Sedar. It’s worth remembering just how incredible the story of Passover is. There are countless lessons to be learned from trials and tribulations of the Israelites – ones you can be sure your child will absorb if you include them. Keep in mind that big gatherings like this can be overwhelming. If your child is old enough to talk, try to keep them at the table. Teach them the names of the different foods and when it’s time to eat them. Before the Seder, try and find toys that can represent the plagues – a little stuffed cow, a frog or insect. No need to make things dark, but visual tools are great to keep the children involved. Remember, children have been part of Passover since its very beginnings. One of the most moving and important aspects of the Seder isn’t to be found in the Torah. Bringing together children with their parents and grandparents represents the everlasting passing of heritage from one generation to another. 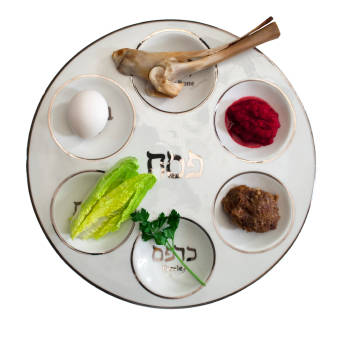 It’s ok to set up a children’s’ table – this can be great fun for them and easier for you – but don’t shy away from the beauty that the Seder represents. If your child is still a baby, you’re going to have to improvise a bit. You can use the Passover holiday as an opportunity to introduce your little one to Jewish foods and flavors in general. Babies have got to love Matzoh ball soup. Have Blintzes and Latkes for dinner any night. It’s fun to eat traditional foods from both strands of Judaism. Cut up some Falafel and mash it in hummus to make your own Holy Land Baby Food. Tzimmes makes a great lunchtime meal for you and your baby. After all the plates have been cleared, it's time for the most fun part of Passover. Racing around the house in search of the Afikomen is something everyone at the table can remember and relate too. Children love it and sit anxiously for hours waiting for it. But first, make sure yours can answer the four questions!